Shingles (sometimes called herpes zoster) is a viral infection that causes a painful, blistered rash that most commonly appears as a band or stripe on one side of the body. It’s caused by the same virus that causes chicken pox, which does not go away after recovery but remains dormant in the nerve roots. When disease, stress, or aging weakens the immune system, the virus becomes active again, causing shingles. Anyone who developed chickenpox as a child is susceptible to shingles, and those who are over 50 years of age, have an autoimmune disease, or have other health problems that weaken the immune system are more likely to suffer the condition. Shingles cannot be spread through touch or exposure; however, an individual with a shingles rash can spread the virus and cause chickenpox in another who has never had it and has not received the chickenpox vaccine. The majority of individuals who get shingles fully recover, without recurrence. Initial shingles symptoms are nonspecific and often lead to misdiagnosis or may be disregarded completely. The first stage includes flu-like symptoms such as headaches, light sensitivity, malaise, and possibly a fever. During the second stage, you may feel itching, tingling, throbbing and/or quick stabs of pain in a specific region of the body. This second stage most commonly lasts one to two days but sometimes as long as three weeks, and in children it is often painless. The third stage brings the characteristic stripe, or belt-shaped, skin rash, often on one side of the torso. However, the rash has also been known to appear on the face, eyes, or other parts of the body. This is when most individuals identify their discomfort as shingles symptoms and contact their physician for treatment. The rash then evolves into clusters of blisters, which fill with fluid, then finally, within seven to ten days, the blisters crust over. Eventually, the crusts slough off, and the skin heals. 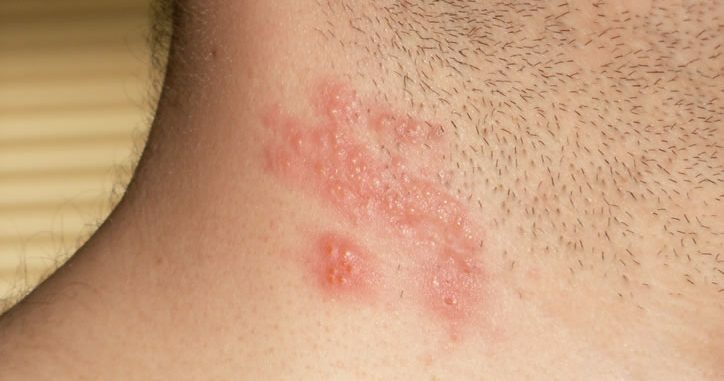 In more severe shingles cases some scarring and/or discoloration may remain. Those who experience continued dizziness, weakness, extended pain or rash on the face, changes in vision, confusion, or a rash that continues to spread should seek help from his or her primary physician immediately. There is no cure for shingles. Instead, treatment attempts to minimize the pain, shorten the duration of a breakout, and reduce or eliminate complications. Earlier self-diagnoses of shingles leads to earlier treatment by a physician. Shingles treatments may include antiviral medicines to boost the immune system for reduced pain and quicker recovery, as well as long-term medication including antidepressants, medicines for chronic pain, and topical skin creams. Vigilant home care also greatly contributes to speedy and full recovery. Keep any skin sores clean. Take medicines as prescribed, and use over-the-counter pain reducers whenever possible.